"Big Bang for Your Buck"
I do love taking things apart. Having spent much of my working life as a musician, I remember clearly (I think) coming home from late night gigs and while still under the influence of various volumes of Jose Cuervo Gold determined it appropriate to fix a malfunctioning musical component by disassembling it. This would take awhile so after a bit of sleep I would find myself unable to put it all back together without several annoying parts left over. Indeed I would have to wait until the next night (late again) when I was in a similar state of cactus overload, in order to remember how it all fit back together. Now this little journey into regression therapy has little to do with injectors (thankfully) but it does serve to illustrate a point. I am continually fascinated by the subtle differences one often finds between a product that works great and one that works but doesn't quite feel right. And feel is an extremely important word here. As with musical equipment that would apparently function nominally but didn't sound quite right or a guitar that suddenly felt - well . . funny, so it is with injectors that will inject but . . .not quite perfectly. Consequently, after several months of enjoying the new upgraded Platinum edition of CTC's Excel tube injector, I figured it time to take one apart (sans Cuervo here on) and see how this great little machine differs (mechanically) from the larger and proven Supermatic design and to likewise see if I could tell any difference between the new and the original Excel. The photo at right shows a bottom view of the new Excel. 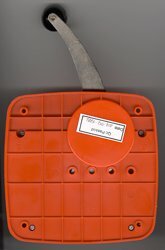 It is identical to the original red machine including rubber pad. We have always appreciated this useful feature and were glad to see that the new Premier Supermatic incorporated this pad design. The next photo (below left) is the same view with pad removed. In my experience with these machines, I often remove the pad to empty extra tobacco dust that accumulates between the pad and the base cover, the logic being that if tobacco is present there it must be more prevalent in the vital workings contained above. (Note the original red color of the base that we found in the prototype we were originally sent. Future machines are silver throughout). This base cover is easily removed by taking out the four screws which secure it to the main mechanism. The third photo (below right) shows the actual innards of the Excel. 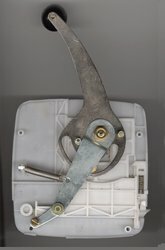 One is immediately, upon close examination, struck by the simplicity of design compared to the larger Supermatic shown at lower left. 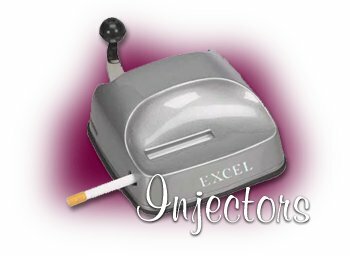 Many of the injectors in the same price range as the new Excel Platinum like the Privileg and SmokyMac employ much less substantial plastic, banding and blanket-like mechanisms that tend to self-destruct far more easily. Needless to say they are not nearly as efficient as even the original Excel in their ability to adequately fill a tube. The new Excel, on the other hand fills tubes at least as well as the original full-sized Supermatic. Yes, it does! After several months of very hard testing we have found them to be more forgiving when over-filled (the main catastrophic action that will kill any injector) than the larger machine with the exception, of course, of the new full-sized blue and gray Premier reviewed previously. This little machine is nice and round and smooth. And as far as the differences in mechanicals, both the new Excel as well as the new Premier Supermatic have identical innards with the obvious difference that much more attention has been paid to detail, finish, and quality control. In other words these machines have been fine tuned rather than redesigned to work perfectly. We agree with this philosophy as we have always felt that the design was inherently sound. We received, as mentioned last issue, three Excels. Two were the original red color and one was the new and quite beautiful Platinum Edition which is shown in all of its silver metallic splendor at the top of this page. Believe me when I tell you we tried every way in the world to screw them up. We used damp tobacco, too dry tobacco, too much tobacco and anything else we could think of and still this little machine hung in there and made perfect cigarettes. To date many hundreds of perfect cigarettes. We have still not recovered from our initial shock of how good this machine really is. The original Excel was good but had a few shortcomings and was not always successful at consistently filling tubes at times feeling stiff and unresponsive. We looked at it (the old one) as a low priced compromise somewhere between hand injectors and the Supermatics. That view needless to say, is no longer viable. We took the Platinum Edition Excel on a week long trip to San Francisco and used it ourselves extensively in addition to letting every Bozo we met along the way use it hoping they would find some creative way to foil its flawless performance. To no avail. This machine is pure dynamite. While there are a number of manufacturers of injection machines, we have made it quite clear from our debut issue two years ago that, in our opinion, the crank style injectors, specifically the Supermatic line from CTC, are the single most important ingredient to a committed and successful migration to Make Your Own (MYO) smoking. The one thing that causes some folks to pause before delving into the world of MYO cigarette manufacturing has been the price of the larger Supermatic. Though by any logical fiscal view of the savings over packaged brands, one should soon realize that even the more expensive machines pay for themselves in a few short weeks. Nonetheless the introduction of a machine that retails at half of the price of the new full-sized Supermatic and that works flawlessly should make the proposition even more enticing for those still sitting on the MYO fence. Additionally the smoother rounded-corner design of this new Excel is quite cooperative for on the road injecting. And as an added bonus to our database, we have received a great deal of feedback from many of the Bozos we referred to earlier who tried the machine. Not only did many of them call our little experimental store and buy them but in some cases bought them for friends as well. It must be added though that these machines, like all injectors, must be protected from the uninitiated user who will likely try to over fill them and then force them to inject. They can still break if abused, but only the most unwary person will suffer this fate. It is important for retailers to stress the proper level of filling and the simple instructions to follow if the machine feels difficult to inject. Customers don't read instruction manuals on simple to use products like these - at least not until they have succeeded in damaging one. 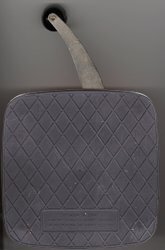 Quite simply if it hangs up, it is too full of tobacco and should be opened back up (uncranked - place the handle in the original position) and the tobacco reservoir cleaned with a toothpick or some other non-damaging sharp object. And most importantly, customers should guard against use of their injectors by "friends" who have no fiscal investment in the machine and often have received no instructions for use. If you are going to let your friends or family use your machine, make it a point (priority) to educate them on the dangers and remedies concerning overfilling. It has been nearly 6 months that we have been putting our original Excel through its paces and it still works perfectly. However a few of the machines we have sold, both New Premier Supermatics and Excels have come back damaged by what our customers describe as "friends" or "family" -usually, "my teenage son and his friends" (we hope over 18). Now we don't baby these machines when we test them for our reviews but for the life of me, I have trouble understanding how people, as long as they follow the simple rules above, can screw 'em up. Again, it should take very little effort to inject the tobacco. If it takes ANY excess pressure to achieve the injection, STOP, open the machine and clean it before resuming. These are precision devices that deserve to be treated as such. Also new to CTC's line is an improved hand held injector with a base, the Premier Deluxe. It is similar in many ways to CTC's other hand-held with base, the older Pressta Deluxe. However, several upgrades make this particular machine even more usable. Certainly no competition to the Supermatics or new Excel but far better than other hand-held designs. The base, as we've mentioned in previous articles on injectors of this type, provides a better grip and a more stable platform for injecting than a hand-held without base. It also looks nicer and has a rubber pad on the base that further enhances performance. An interesting feature of this machine is that the injector part can be placed in its slot in either direction making it instantly switchable for either left of right handed use. Now of course a left hander could certainly simply turn the machine around to use his left hand but changing the injector direction itself actually does work better. Judging from the wholesale cost one would expect to pay about one-third as much for one of these machines as for an Excel Platinum which makes it less than half as expensive as Gizeh's outstanding Gold Tip Producter. (For the math agnostic that equals: $25+ for the Excel, $16 for the Gizeh, and only $8 for the Premier Deluxe. 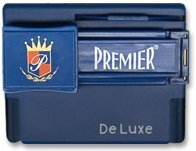 Of course, the Premier Deluxe doesn't have the little compartment for extra tubes that the Gizeh has but for one on a really tight budget, this machine is certainly worth the small difference one should expect pay when compared to an ordinary hand injector without a base. The increased size of the big square knob on the handle also contributes to far better control during injection. Ever wonder what the original Supermatic injectors looked like. See our Reviews Section in this issue (click the Reviews button in the menu above left) as we do a biography on the folks who started it all and the evolution of the machines they created. As a last note, all of the above is written with a huge amount of gratitude that is daily expressed by our customers, our readers, as well as we at RYO Magazine personally, for the efforts of those manufacturers in the MYO industry who, often at great financial risk, continue to provide significantly improved and evolutionary products to help make the case for MYO. The possibility that one's first experience with making their own cigarettes will be a negative one, is quickly dwindling. the ed.